Thomas Salme, best known to Lucire readers as our Milano photographer and occasional correspondent, has released his new book on an infamous period in his life. In the spirit of Frank Abagnale, Jr, Thomas posed as a pilot—but for 13 years, actually flew the aircraft. Thomas did once hold a pilot’s licence for private and small commercial planes, but when he began as a pilot with an airline, the one he had was expired. Not having the €100,000 to amass the flying hours he needed to become an airline pilot, he trained himself up on simulators at the SAS Flight Academy, where an engineer allowed him in, never suspecting his plans. His original scheme was to apply for a co-pilot’s job and he forged a licence, knowing that European pilots’ licences differed throughout the continent. In his 13 years, he actually had an impeccable safety record, and never had a single accident. On March 2, 2010, the jig was up, and Thomas was arrested at Schipol airport, while at the cockpit of a Corendon Boeing 737. Aviation police had had a tip-off, and were waiting for him at the gate. He was eventually fined and banned from flying for 12 months. In that period, no one had ever suspected Thomas. No one checked, not even in the six-monthly testing that he underwent as a co-pilot and, eventually, a captain. Even his résumé had a fictional airline—Aladdin Airlines. 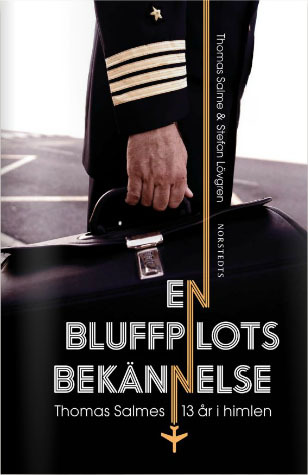 Thomas’s new book, En bluffpilots bekännelse (A Fake Pilot’s Confession), written with journalist Stefan Lövgren, outlines his experiences. A documentary, This Is Your Captain Speaking, follows next year. He told Svenska Dagbladet that he felt relieved when he was discovered. ‘Every time the phone rang, I thought, “Now, the adventure is over.”’ However, Thomas has always expressed some pride in his past, though with a sense of shame in having lied to those closest to him. His motive was financial, having come from difficult circumstances. After he took his course as a pilot, he found he had a family to support, though when he was exposed, he had already made plans to become a photographer. His debt paid, we began working with Thomas in a more earthbound capacity. Our friend and occasional contributor Nathan Hotorua Gray is jet-set, rather than a jet pilot, and also has a new book out this month. The Age of Fire is also reflective in some respects, as Nathan heads to some of the world’s different battlegrounds and offers a first-hand look at humanity.